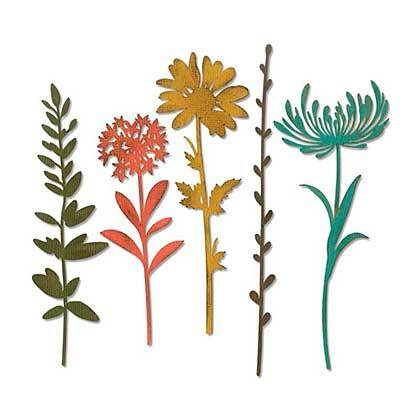 The Wildflower Stems #1 Thinlits Die Set features long, graceful stems and blossoms in silhouette. Use them individually, group them together on cards or canvases. These 5" designs mix and match effortlessly with Tim's previous wildflower dies to make striking compositions. Package includes: 5 wafer thin dies that range in dimensions from 0.5" x 5.875" to 1.25" x 4.15". The Thinlits dies in this set are compatible with the BIGkick, Big Shot and Vagabond machines. (sold separately). The dies are part of the Alterations Collection by Sizzix. Natural beauty has never been so easy.